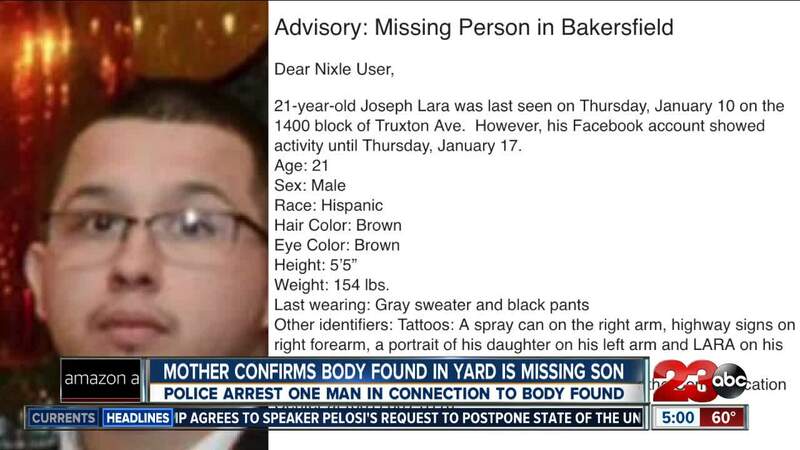 BAKERSFIELD, Calif. — The mother of Joseph Lara has confirmed via social media that the man found in the backyard of a Southwest Bakersfield home is her son. According to KCSO, 21-year-old Joseph Lara was last seen on Thursday, January 10 on the 1400 block of Truxtun Ave. However, his Facebook account showed activity until Thursday, January 17. During the early hours on Wednesday morning, a man's body was found in the backyard of a home in the 6200 block of Hathaway Avenue in Southwest Bakersfield. And later on Wednesday morning, the Bakersfield Police Department confirmed Dennis Marroquin was arrested in connection to the man that was found. He faces multiple charges, including concealing or attempting to conceal an accident death, conspiring to commit a crime and destroying or concealing evidence. He's due in court on those charges on Friday.